The cell surface of mammalian cells is populated with a wide array of proteins that are involved in many aspects of cell-cell communication that is absolutely essential for life. When a normal tissue cell is transformed into a cancerous cell, it often exhibits proteins on the surface that indicate that it has become aberrant – no longer subject to the usual controls that inhibit unrestrained growth. These “marker” proteins are frequently used to identify cancerous cells and therapeutic strategies are being studied to exploit the presence of these proteins to preferentially kill tumor cells. However, in some types of cancer no unique markers are identifiable. In order to circumvent this obstacle, Zhiyu Wang from the University of Illinois recently reported on a methodology to positively identify cancer cells that relies on a different approach. Their research strategy can be described in the following way. They incubated tumor cultured cells with a class of compounds called sugar azides (structure shown below). 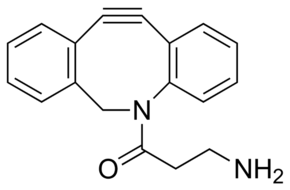 The compound DBCO (structure shown below) binds preferentially to sugar azide on the cell surface. In order to ensure that the sugar azide appears only on cancer cells, the researchers modified the sugar azide with protective group that could only be removed with an intracellular tumor-specific enzyme. Once the DBCO-sugar azide complex is on the cell surface, it can be exploited to deliver cancer treating drugs or agents that can used to provide important imaging information. This methodology has been successfully employed against colon cancer tumors and metastatic breast cancer in the mouse animal model.